Our Personalised Wooden Star Keepsake makes a lovely gift for a little one. 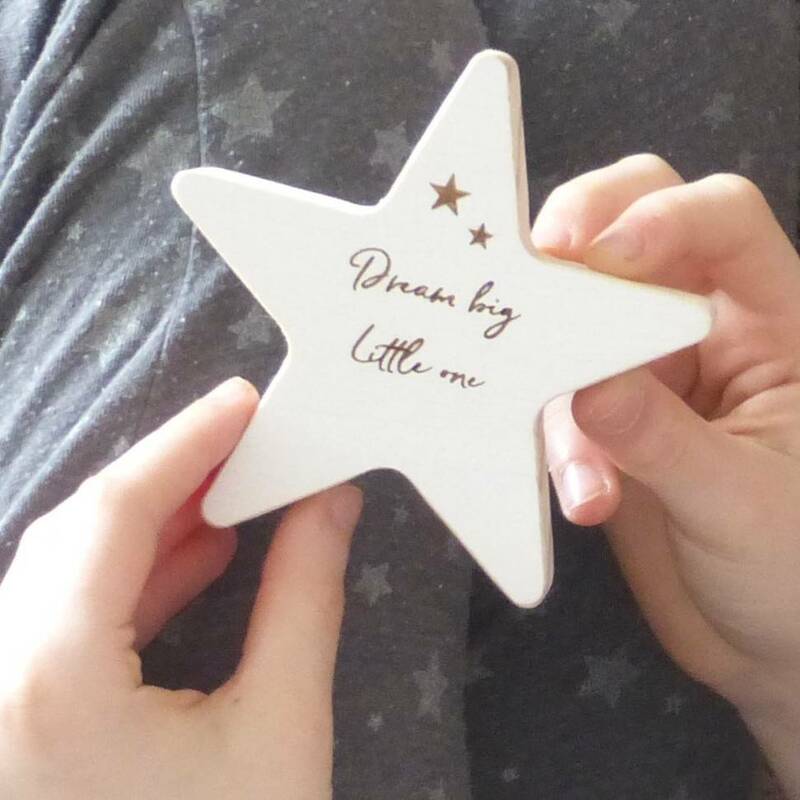 Each wooden star will come with the message 'Dream Big little one' engraved onto the front as standard. You can choose to add your personalised message onto the back of the star to make a unique gift. They would look lovely displayed in a child's bedroom, nursery or even on your office desk. Our personalised wooden stars are intended as a decorative item and not as a toy. Select the size of the star that you would like. Fill in the options menu with the message of your choice. Choose to add an organza bag to your order. Please carefully check that the information for your personalised message and your delivery details are correct at the time of placing your order as we cannot guarantee that any adjustment requests made after your order has been placed will be possible. Please note that each personalised star decoration is made by hand as a result the wording may not be perfectly aligned, and the spacing may not always be perfect and will vary. Each star will be completely unique which we think makes them extra special.